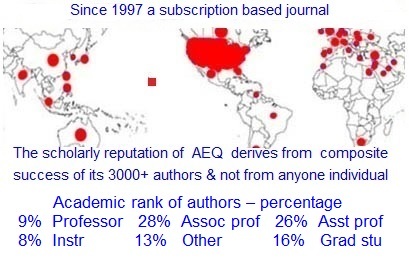 When AEQ started, in 1997, it was run as most academic journals: one office, key editors from the same college who were able to see each other daily, a couple of student workers, and few financial concerns, since the journal was subsidized by a college. See selected pages of Issue One, Volume One, Fall 1997 for highlights of its inception. After 3-4 years, the journal outgrew college expectations and surprised its editors. Use of the Internet and a virtual organization as a platform of communication among readers, authors, and editors played a major role in the journal's rapid expansion, allowing it in 2001 to move to New York and become an independent organization of professional educators. Today, because our readers - aiming to assure quality teaching at their colleges - share Academic Exchange Quarterly with colleagues, this journal has assumed a prominent publishing position.